Pops displayed an unpredictable mix of emotions; from extreme bouts of cold silence, impatience with those he stamped undesirables, moments of fierce rage and weeks playing the good humor man. We never knew which one would be present at the dinner table. He harbored a cargo of anger and a shipload of prejudice. Outside family hours he was a hit with men who entertained his sporting attitude, folksy politics, easy manner and rock solid positions on positions. He viewed black Americans as the opposition even though he enjoyed their company; envied their musical talents. He viewed people on the left of the political landscape as the enemy - and himself - to the right of Goldwater - a place where imagined deadbeats were tethered to the electric chair and unceremoniously fried. Seriously, if he could have had a hand on the lever he would have pulled without mercy or consideration. These attributes don’t paint him a crusading zealot but more a man who lived by his own definitions and appraisals of others in an expanding world that seemed to be squeezing him farther to the edge - which brings me to a very honest and funny episode. We were driving the back roads from Cincinnati, Ohio to Jeffersonville, Indiana after spending the day at the Cincinnati zoo, when we stop for gas. May heat charmed and family time with big dad a bit of fun unless you asked for a chilled Dr. Pepper. Let’s just say that was like asking for a down payment on a seaside estate in Malibu. Most times he’d buy one for himself. Occasionally we would suggest and he’d respond as if we were there to remind him of his thirst, then ignore – other times he’d quote the price, “that cost a nickel,” and buy one to be sampled between the two of us. This was a classic old time service station with a feeble dog at the entrance lounging near a patch of crude oil, a few discarded fan belts, an old Packard on racks and a grease monkey hobbling underneath. Pops goes to pay for the fill up and discovers a mysterious wooden box on the counter. The rectangular container looked out of place as though something alien was being detained for top secret government inspection. The man behind the counter looks down, rubs his chin, lifts his ball cap and smears a mix of toxic oil and sweat lingering around his eyes and swipes upwards into his hair. The man had a nose christened by years of hard time with bottles of Johnny Walker Red. “The only animal that can kill a King Cobra Mr.!,” says the attendant. Brother Wayne and I close in and hover above and long study the interior, cushioned with a bed of sweet grass, a partially eaten carrot and a couple cotton balls. 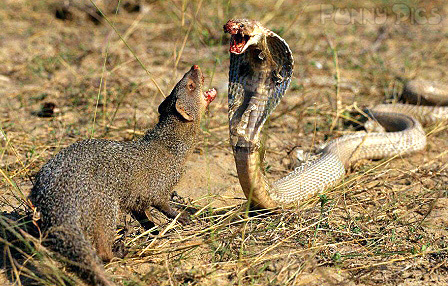 “This boy kills deadly snakes – it’s a Mongoose – you only find them in India,” says the man. “How’d you get it,” dad inquires. By now my brain is in Marvin Perkin’s knapsack .. I’m thinking Wild Kingdom. Cobras? Snakes kill! Some even spit venom in your eyes. This is getting scary! I had no idea how familiar pops was with India unless he thought the man meant Indiana but I knew dad watched plenty of television and had a passion for animals and shows that replayed lions munching on antelope. “Why don’t you folks step over here and have a good look. I’ll coax him out of his hiding place,”says the man. We levitate above and watch as a minute clump of fur disappears through a small mouse hole then slips into seclusion. This was the perfect pet cage for kitchen or front porch just big enough for a colony of gerbils. Just as we’re lulled into a trance – "Whop!" A tail springs out - comes snapping like a whip downward and smacks dad across the face. Wayne and I run screaming for cover. Dad high jumps - trips over himself and nearly falls - mumbles a few words then looks around as if the rodent had escaped through the neighborhood. “Where’d he go,” he asks. Mr. Texaco busts into laughter nearly cracking his head on a jar of screws hanging from above. He continues laughing as if he just heard the funniest joke ever recited on Hee Haw. Wayne and I slip back to discover the killer Mongoose was nothing but a tuff of fur dangling from a string. The both of us had made a hasty exit as dad was trying to retrieve his balance and come slithering back as laughter began to settle. After recognizing a good punking we hung around nearly paralyzed by the event. The recap went on with emphasis on minute details repeated and replayed like breaking news on modern day cable television. Dad for his part wasn’t leaving until he understood and memorized the construction of the gag box. He had a dozen or so questions all measured in inches and decimal points. The next hundred miles was a joyous celebration. Dad regurgitated every detail from start to finish and we howled like hungry wolves – then he’d rewind the story again. Now, somewhere - maybe twenty miles outside Jeffersonville we’re sworn to an oath of secrecy. I’m calculating it was worth two Dr. Peppers.! Late evening I catch pops with tools in hand and a pile of wood, cutting and sawing. By morning he was putting the final touches. Mother was distracted and held in custody somewhere near the front porch and church. I begin to suspect he was thinking of dropping this on her first, then make a move on the city populous. I’m sure mom hadn’t a clue what that was even though she was schooled in Wild Kingdom. I knew this because she watched him when television was on. I never knew if this was self-preservation or she liked watching the reflection off his bald head. Pops lines mom up then begins the con. “This animal kills cobras – people die all the time in India.”OK..Mom scans the box then looks back at him mostly disinterested but loyal enough to entertain his quirks and hobbies. "What’s it doing in our house,” she asks. “You’re going to have to get in here closer,” he says. Mom looks on suspecting he’s up to something. She’s lived through these set-ups before in fact she had to save him the night he ran afoul of the law Halloween 1950 when he spooked some neighborhood kids while running the back alley ways draped in a Nazi flag. I was too young to know the details but I remember seeing him enter the house in a panic. I know the police arrived and parents were pissed. I think they confiscated the flag but had no idea he had a closet full of splendidly carved French rifles from the revolution stashed along with his Winchester. “Plap!” The funky little piece of tail springs upward - smacks mom like a bolt of lightning center face. She collapses nearly paralyzed by fear. Pops starts laughing uncontrollably. Mom was a small diminutive woman with enough ice in her veins to halt global warming but with him she was pliable and gag worthy. That evening the magic box sat dead center of the kitchen table charming the nearby decorative plastic fruit. Wayne and I would play around with the string that manoeuvred the tail and try to make it move life like. We didn’t unlatch for fear the thing with loaded spring could crush a nose or jaw absent supervision. A few nights pass when church folks mysteriously arrive. Dad gave his usual sermon telling everyone Elvis was a three chord wonder and he knew four. He’d retrace a childhood chastised by poverty and his valiant efforts to confront and live an extra mile or two of the American dream. In his world hillbillies were dimwits and he was master and commander. Wayne and I could almost recite verbatim. After a bit of church banter - a few “aw hecks” .. dad strolls in with his box of laughs and places middle of the floor then goes into this elaborate dissertation on Indian culture and the ceremonial roll of poisonous snakes and flutes. The religious folks from church were gentile and white – very white – this was Andy of Mayberry, the Edge of Night meets vanilla pudding and pound cake. Church folks spoke in soft tones and made one feel they could endure the most terminal ailments of the afflicted. I remember mom worry about a young child born with a hole in its heart. She made a daily pilgrimage to its bedside making sure there was a continuous stream of caring hands and faces. Dad let all questioning pass before encouraging everyone gather around and study the slight movement inside. “Does it eat a lot – do you feed it mice – I see a lot of green stuff in there – is he hiding under it, does it bite people,” asks the preacher man. “Bam!” Dad hits the switch and bodies go flying. A couple leap on the couch a couple dash from the room. There was screaming, crying and loads of eye popping terror. Pops loved it. He couldn’t stop laughing. Of course us boys stood around basking in the old man’s insanity. I think mother was in shock. I don’t know if she bought into the sudden draping folks were absorbing. A few more days pass and dad shows after work. His life was all about plant protection and security. He walked building to building for thirty years locking and unlocking and chasing the occasional thief from Colgate Palmolive dump. I don’t think we ever purchased detergent or a bar of soap. The back porch was jammed with an infinite supply of both. Palmolive soap and its sister Camay was much like applying scented sandpaper to skin. He arrives home just past three thirty with a tale to tell that tops all. “I sprang the mongoose on the black men down by the dump – you should have seen their eyes jump out - big as cannonballs I tell you,” he says.” Then they say, “King – you crazy – why don’t you hang around until …Hubert gets here .. he’ll leave his drawers.” Dad does just that – he made a day of comedy and surprise for everyone – he became legend. We knew the old man harbor deep prejudice but only when convenient. It wasn’t that he hated blacks -he just didn’t want to fall any farther below the poverty line than his memories of growing up. This was depression era fear – class warfare! A white man with a tenth grade education and a black man with a college degree were basically the same man or a least he convinced his alter ego they were on the same stage. He was tended to by black families as a child and had fond memories but when you grow up near the economic bottom there always has to be someone below who can make you feel good about yourself – at least that’s what class structure is all about. He understood his dilemma and knew there weren’t many routes of escape. He grew up in a house full of women – three sisters a mother and an absent father who died early on courtesy the ravages of alcohol. Before the Great war he was care free and the funniest man walking the border between Kentucky and Tennessee but four years of combat robbed him of sleep and filled nights with reoccurring nightmares. He watched the Honeymooners – everything Jackie Gleason, Red Foxx, Flip Wilson as Geraldine and repeat the catchiest lines to anyone in listening distance. The mongoose in the box gave him a prop, something to make the world laugh on his terms – be that entertainer. Every summer we’d make the journey to grandma Michelone’s farm in Williamsburg, Pennsylvania. For us kids it was the best experience in life and the only time we could break free of the tension. The community nestled in the Allegheny Mountains was in an idyllic setting more storybook than real. This was big painterly landscape with dairy farms at the centre. To get to Willamsburg you had to pass through Pittsburg before the bypass was built. Pittsburg was the home of Carnegie Steel. The sight of monster girders, orange colored sky, the blast furnaces and sound of pumping industry thrilled every time we got within viewing distance. The smell was overwhelming as was the reality the fresh water routes leading through the mountains downstream were slowly dying. Just outside Pittsburg pops makes a pit stop for gas. Inside a black man stood smiling behind the counter. Dad exchanged a few pleasantries – told a few tales then fished the man in with the mongoose in the box drama. The man bought it. A few moments pass and pops is lowering the back door to the Ford Fairlane station wagon , shoves luggage aside and places the box in middle. Thus begins the every evolving tale of cobras, flutes, deadly encounters, killings and capture. By now dad was so well prepared he had us hooked in suspense. “Just get down where you can see it,” he says. “What you got in there a rabbit – you feed it rabbit?” the man asks. “Snakes? I don’t like snakes – he can have them all,” he says. Just as the last word was leaving his lips dad pops the lever and – “Bang!” The tail flips and hits him dead center of his cap. Off he runs smack into a fence then starts climbing. No escape. Pops bowls over and ties himself up in a laughing frenzy. We stand back and giggle and wonder where this is leading. Dad calms him down and starts to explain how he built and gives him the facts behind the traveling show. The man ponders then decides he should build one - leave on the counter and nab a few passing tourist. The ride through the mountains – through Altoona, Hollidaysburg and past Canoe Creek into Williamsburg was always a thrill. You knew twenty miles or so beyond town the smell of the paper plant was going to sting the nose and the sight of dairy farms elicit an inner scream of joy. Dad wasted no time uncrating the magic laugh box. It was noon and the basement of grandma’s house was crammed with family – uncle’s Joe, Medie, Roger, Jerry all football players were out talking one another. You want to hear laughter? This was big heart family who roared. One would pay a hefty admission to experience first-hand the earth rocking joy these brothers brought each time they were together. On this occasion a best friend and football star was in the house, Galen Hall. Hall was born in Altoona and after the death of his father was raised by his grandparents in Williamsburg. He would play quarterback under Rip Engle’s at Penn State giving the Nittany Lions two seasons 1960-61 to celebrate bold victories. He would later join the pro league Washington Redskins then later New York Jets in the newly formed American Football league. The basement looked like a farmer’s market with precious cooked foods everywhere. Grandma would hand cut the pasta strips and fold the raviolis to a precise shape then cook. The smell, the smell was identifiable for hours on end - it was a luxurious aroma as if transported from the kitchens of Italy. Then the aunts arrive with an assortment of cakes, cookies and cupcakes and fresh baked pies. This occasion the pies cooled in the kitchen adjacent to the back porch. The back porch wasn’t like any ordinary back area – it held up the house. It was an open area with family history and windows stretching the entire length – concrete floor, a couple deep freezers and park benches. Hanging above; the fly collectors or Vapona pest strips. The room was long and necessary for the number people who showed for lunch. The adults filled the main seats, kids the small benches and tables set aside for young ones. Wayne and I were old enough to get a seat with the main cast if room permit. Even a walk past garnered a big hug – a squeeze and scrape of chin whiskers across the face. These were big muscle arms – the kind of bulging arms that farmers get from repairing heavy machinery and young men from tossing bales of hay. Pops had an audience – big star quality audience! Dad planted the magic laugh box on the kitchen table just out of sight of the dining area. He calculated the best angle for maximum impact. The room was bright and sunny with just a whiff of lunch cooking and three pies cooling on the stove.
" I’d like to show you all something remarkable – I have a mongoose in the kitchen,” dad announces. “It comes all the way from India and it’s the only animal in the world that can kill a cobra – in fact it eats them.” You could see the look of horror on my aunt’s faces. Suddenly, men drop napkins and chairs screech as they hustle in for the con. In the room – Galen, Joe, Medie, Jerry and Roger – enough prime beef to shove a mountain back into the sea. Dad begins his pitch.”They run around the cobra and try to get to its backside and sink those sharp teeth in its neck.” The men move in closer all while pops has a string around his finger slowing pulling the patch of fur into the sheltered room. The men hover above all nodding in agreement. “It escaped from a circus train and was caught by a service station manager who saw it eating garbage,” says dad. “Bam!” dad pops the lever and the tail piece soars through the air. Tables and chairs get kicked over – bounce off walls - big flesh charges in four directions. Roger leaves the room and comes back with a stick. “Where’d he go, let’s surround it”, he directs. Joe is near unconscious – and Medie looks confused but the best topping to dad’s short run with the magic box - Galen Hall leaps backwards and lands on the stove in the pies. The house explodes with laughter. Grandma runs in crying tears of laughter - speaking half Italian and broken English. “You’re in my pies, my pies” she says. Galen looks like an eight year old child caught in the act of something forbidden. The next few hours the house shook. Men with this kind of organic energy can rattle stone walls and this they did with belly laughs so immense cracks appeared in the earth under the house down to the nickel-iron at earth’s core. Dad kept the box in motion a few more uneventful episodes but nothing rivaled the big show – Carnegie Hall in the basement. Dad was the master, the conductor playing the best audience on earth. He made them laugh just like Gleason and Foxx – no better time to drop the curtain on the entertainer!